How to dress when you go to the Club or Casino is easy as pie when you know about Manzini jackets and blazers. Their collection of jackets and blazers are perfect for the night life and life style you want to live. 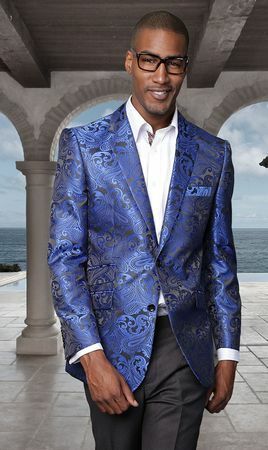 This royal blue paisley blazer has a modern style fit that is more tailored than regular fit with side vents and made of a terrific royal blue shiny paisley fabric.